Slab blocks at the Alton West Estate, 1960s (Credit: Design Council Slide Collection at Manchester Metropolitan University). As a student I used to drive past this post-war mixed development estate on my way home. 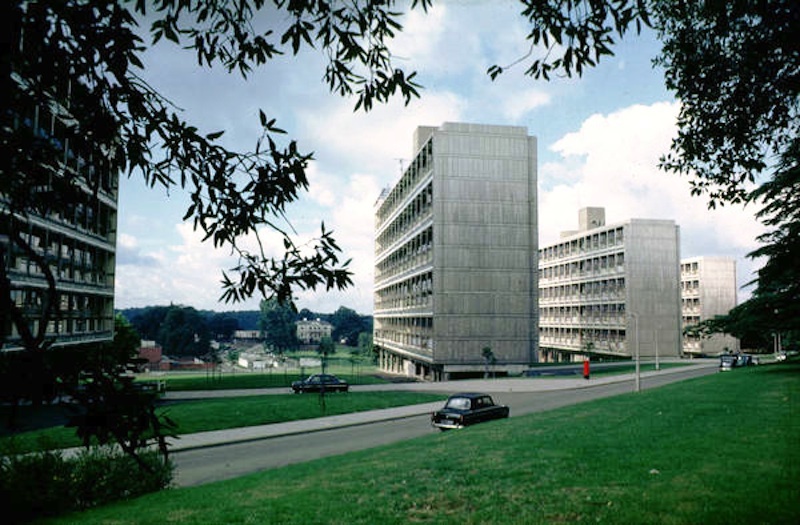 I selected it for my undergraduate dissertation as part of my History of Art degree, focusing on the influence of Le Corbusier and Scandinavian models on London County Council’s architects. The site next to Richmond Park was formerly occupied by large country houses , and the fact that it was being transformed into homes for the ordinary people of London seem to sum up the transformational nature of earlier post-war governments. One of the interesting things that I discovered in researching the LCC archives was that the architects had asked to live on site as part of the design process. It wasn't until 2007 that I managed to see the model for the majestic slab blocks – the Unité d’Habitation, in Marseilles. Richard Rogers explored the Alton estate in a BBC programme from 1996. Fans of François Truffaut may recognise it from one of the scenes in the film Fahrenheit 451.